What do you get when you combine a classic tiara design, a renowned jeweler, and one of the most fascinating princesses of the twentieth century? 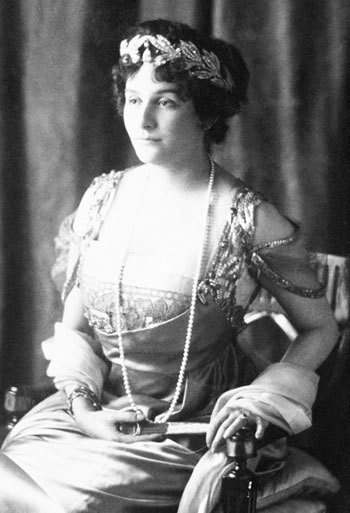 The answer, of course, is today’s tiara: the olive wreath diadem created by Cartier for Princess Marie Bonaparte. Descended from Lucien Bonaparte, one of the younger brothers of Napoleon, Princess Marie was born into the imperial line of the French monarchy. She was also the granddaughter of François Blanc, the French entrepreneur who developed real estate and casinos, including the famous Monte Carlo Casino in Monaco. With Bonaparte blood and Blanc money, Marie was both a princess and an heiress. Such a celebrated heritage required major jewels, and one of the most significant pieces in Marie’s collection was this olive wreath tiara. It was a part of the princess’s trousseau on her wedding in 1907; her groom was Prince George of Greece and Denmark, one of the sons of King George I of the Hellenes. The tiara was designed by Cartier as a wreath of pave-set diamond olive leaves studded with eleven cushion-shaped diamond “olives.” Those eleven diamonds can be swapped for other stones. Originally, the “olives” were apparently set with emeralds; Marie also switched out the emeralds for rubies on occasion. The show-stopper of the piece was the enormous pear-shaped diamond that was mounted en tremblant at the center of the piece. The wreath design was meant deliberately to evoke the tiaras worn by the Bonaparte women during Napoleon’s reign, paying tribute to Marie’s French imperial heritage. It was also a perfect tiara design for a princess marrying into the Greek royal family. Marie’s marriage to George was complicated, to say the least. (I’ll let you all read up on the specifics. Let’s just say that George and his uncle, Prince Valdemar of Denmark, were lovers.) Marie’s anxieties about her sexual relationships led her to psychoanalysis and Sigmund Freud, with whom she had a deep and long-lasting friendship. She became so committed to the practice that she even offered to psychoanalyze the man who sat beside her at the 1953 coronation of Queen Elizabeth II of United Kingdom. (The new queen was Marie’s niece by marriage, and her seatmate was François Mitterand, the future president of France. They reportedly paid zero attention to the actual crowning that was happening in the Abbey.) Marie just so happened to be wearing this tiara on that day, too, but she’d flipped it upside down and replaced the pear-shaped diamond with a diamond star. (The diamond star could also be worn as a part of a separate star tiara.) She's pictured above at the coronation with her daughter, Princess Eugenie. Princess Marie died in 1962, and about thirty years later, her tiara went up for auction. The central diamond was missing from the tiara at this point, and the alternative emerald and ruby stones were also apparently not included in the sale. 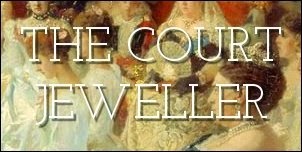 The tiara was purchased in 1999 by the Albion Art Institute. They replaced the pear-shaped diamond, and now the tiara is shown in exhibitions around the world, including the recent Cartier: Style and History exhibit.